There's nothing like biting into a hot sausage, perfectly spiced and seasoned, with juice exploding in your mouth. Plain sausages are always nice of course, but why not turn them into a simple one dish meal? 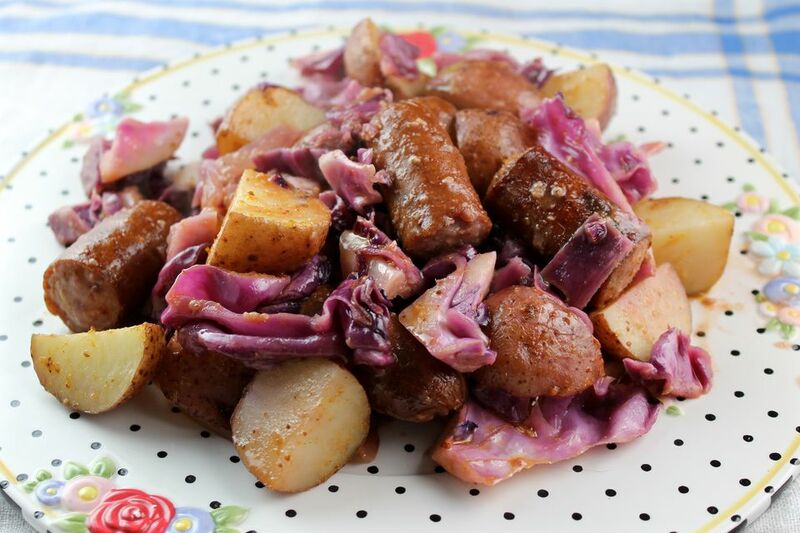 Potatoes, cabbage, onions, and garlic are added and drizzled with a super simple spicy sauce. The only issue with this recipe is that the potatoes must be partially cooked ahead of time. This is a simple additional step, and doesn't take much time or effort. We prefer precooked Polish sausages in this recipe, but you can use your favorite sausage type. If you use sausages that are not precooked, you will have to test them with a reliable food thermometer before you can eat them. Make sure they reach at least 165°F before you eat. You may want to brown the sausages before you add them to the dish with the other ingredients. All this meal needs is a cold beer and perhaps a green salad or some fresh fruit for flavor, color, and texture contrast. Enjoy it on a cold winter night when sleet is tapping at the window. Make a fire in the fireplace and enjoy. Place the cubed potatoes in a large microwave-safe dish. Add about 1/4 cup water, cover the dish with waxed paper, and microwave on high for 3 minutes. Test the potatoes; they should be tender enough so you can pierce them with a fork, but not tender enough to eat. The time will depend on the size and power of your microwave oven. Preheat the oven to 400°F. When the potatoes are partially tender, combine them in a large baking dish with the cabbage, onion, and garlic; toss gently to combine. Add the sausages on top of the vegetables, tucking them into the cabbage mixture slightly. In a medium bowl, combine the ketchup, Dijon mustard, and horseradish sauce and mix well. Drizzle this mixture over the food in the baking pan. Cover the pan with foil and put in the oven. Roast at 400°F for 45 minutes, then remove the foil and test the cabbage and potatoes with a fork. They should be tender at this point. Uncover the dish and roast for another 10 to 15 minutes until the potatoes start to brown at the edges, the cabbage is tender, and the sausages are done. Serve immediately, right out of the baking pan if you'd like.